Melissa Foster is quickly becoming one of my favorite authors, introducing me to aspects in story lines I wouldn't normally read. Chasing Amanda is one such story. Typically, I try to steer clear of stories pertaining to a child being brutalized and/or kidnapped and I haven't been one to read much in the way of paranormal elements in fiction. However, despite purchasing three of Melissa's books near the same time - weeks before I would read either - it only took the reading of Megan's Way to have me hooked. Whether in life or through works of fiction, Melissa shines. Just as she, herself, is rich in character, she creates memorable characters and weaves plots unlike any I've read, keeping me guessing and wondering until the end, especially in the case of Chasing Amanda. Of course, I had everything figured out in the early sections of the book - or so I thought - and felt a level of dismay as to the direction I thought the book was going. I realized just before the book ended that I was way off base and the ending took me completely by surprise. I was definitely pleased at the turn of events. Psychic abilities are debatable in many circles and, admittedly, I've never sought one nor as much as sat in front of a crystal ball nor have I had my palm read. That being said, I am also a person who has nightmares after reading a horoscope so, as you may imagine, I avoid anything of the nature. However, I do know what it's like to have a sixth sense - just not to the extent described in Chasing Amanda. Even so, the story was truly intriguing and I'm pleased to announce I didn't have any nightmares during the time I read the book, nor afterwards. Speaking of psychic abilities, I witnessed the struggle between a man and his wife because of his unbelief in her abilities - in what she referred to as the "knowing." I saw how it was slowly destroying their relationship and feared it would come to ruin as so many other marriages do. I was pleased that, in the end, he decided to give his wife the benefit of the doubt and take her at her word. However, it came as the result of something he didn't expect - but just may have saved his wife's life in the process. On a personal note, in my tenure of reviewing books, I've read many story lines I've never previously considered and have enjoyed opportunities to stretch my imagination. I've had opportunities to develop friendships with a few terrific authors along the way and I must admit that I'm looking forward to all that 2014 may bring, especially as I delve deeper into the world of fiction and continue to meet outstanding authors and the memorable characters they create. 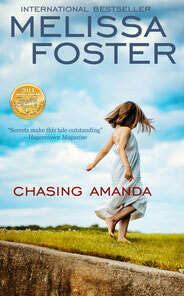 Chasing Amanda is a book I'm sure most female readers would enjoy, regardless of their beliefs. If you would like to learn more about this book, please click the book cover which will take you to Chasing Amanda's page on Amazon. If you would like to read my review of Megan's Way, click here. Last, but not least, read the interview I had with Melissa Foster. I'm sure you will enjoy it.